Since I've been waxing lyrical about podcasters I enjoy, I must mention one of my favorites- Libby of Truly Myrtle. 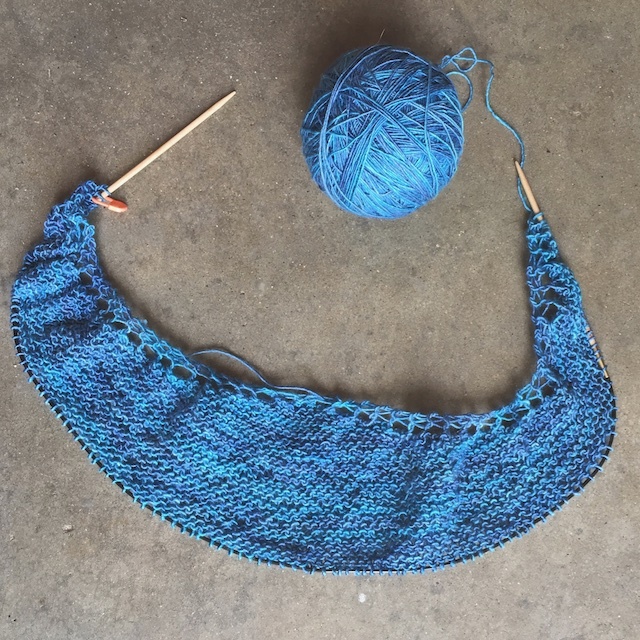 This is her pattern, Settler Shawl, that I'm working on for the Truly Myrtle Knitalong. I don't quite remember where I first met Libby. Maybe it was on the Very Shannon forum. I was immediately inspired by Libby's crafty take on life. There is nothing she can't make! 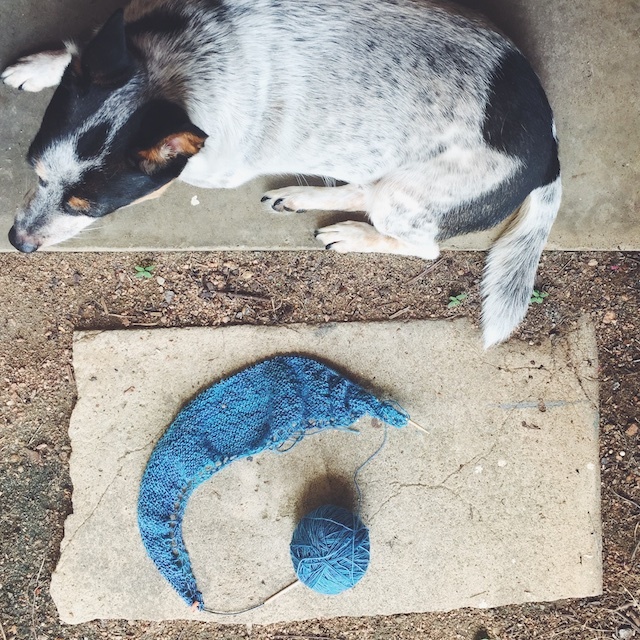 Her instagram is sweet for it's knitting, but even more for her sweet little ones that she is often knitting for. Really, my husband and I were at the movies, waiting for Mad Max (of all things) to start and we both "Aw! "-ed out loud as I scrolled past an instagram photo of her daughter in hand knits. Libby exudes a love of family and home. She was also the first person I noticed online who was creating a handmade wardrobe. I was amazed at her skill. It didn't stop with sewing and knitting; there was handmade jewelry too! One of her shawls was my gateway drug into the world of shawls. Her Rattan Shawl is now off of my needles, waiting for photo editing and Settler is my current tv knit. After sacrificing some of my most precious skeins of hand dyed yarn for shawls, I now completely understand the addiction. 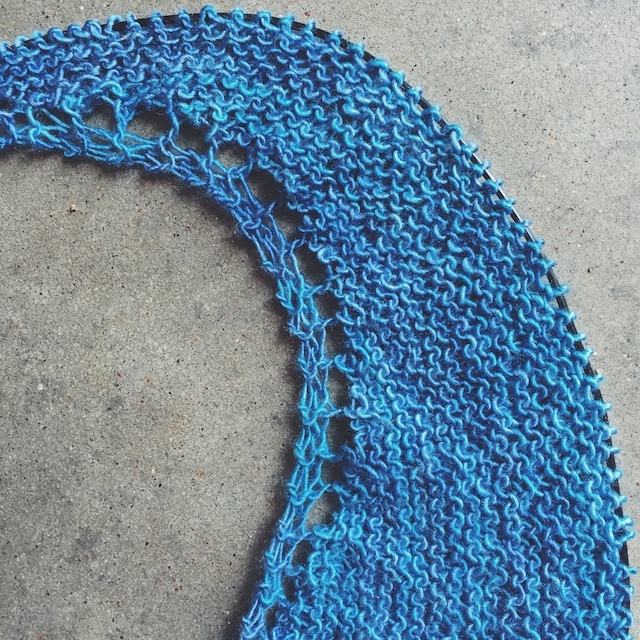 Shawl knitting may be the best way to enjoy a beautifully deep color. It satisfies my need to create, but I also find that it meets my need to be surrounded by beautiful, natural (and sometimes unnatural) color. This need for color and beauty exceeds my desire to make, at the moment. Mine can be a grey world. I would love for my need for color to be satiated by my natural surroundings, but that's not going to happen at this time in my life, so I'm afraid yarn, textiles, and art will have to do the trick. So what do you think of this Quaere Fibre merino/ silk skein? The colorway is Mr. Blue Sky. I don't think these photos entirely capture how Caribbean this blue is, shifting to a lighter shade, then back again in a few stitches. Every time I sit down with this project, I hear either Yaz's Mr. Blue, which is kind of a electro-pop downer, or Enya's Caribbean Blue. That's probably a better fit for this shawl. It's also a great link if you're day is lacking in color.